Coolangatta, Queensland/AUS (Thursday, March 15, 2018) – The first stop on the 2018 World Surf League (WSL) Championship Tour (CT), the Quiksilver and Roxy Pro Gold Coast, witnessed an incredible start to the season as Lakey Peterson (USA) and Julian Wilson (AUS) claimed victory today in extraordinary conditions at Kirra on the Gold Coast of Australia. Unpredictable performances and massive upsets shocked surfing’s biggest stage at this year’s season opener to remind the world that anything can happen on the Championship Tour. In addition to Peterson and Wilson taking the wins today, a new generation of surfers stepped up to showcase their progression, determination, and potential. Peterson blitzed through the competition with the goal to surpass her 2017 Roxy Pro runner-up finish. The Californian was unstoppable as she took down two-time WSL Champion Tyler Wright (AUS) in the Quarterfinals, Malia Manuel (HAW) in the Semifinals, and Keely Andrew (AUS) in the Final. Peterson is one of the most consistent high-scoring surfers on Tour and continues to push performance boundaries in the competitive space. The intensity and innovation brought by Peterson are now paying off with her first CT win since 2012. Last season, the Californian had previously earned runner-up finishes at this event and in France but now overtakes Wright for the top spot on the Jeep Leaderboard. Peterson dominated the Final from the get-go, posting an excellent 8.00 point ride for a long barrel ride. She then backed it up immediately with a 7.67, leaving Andrew in a combination situation (needing two scores). Andrew was unable to find a wave of substance, which left Peterson to take the first event win of 2018. Previously, Andrew took down Australian superstar Sally Fitzgibbons (AUS) in the Semifinals and six-time WSL Champion Stephanie Gilmore (AUS) in the Quarterfinals. The runner-up result for Andrew is the second Finals appearance of her career. Andrew, who powerfully charged into the new season, will look to continue to climb the rankings and earn her first CT victory. The 23-year-old Australian will now vault from 11th to 2nd on the Jeep Leaderboard. Wilson has had a rollercoaster start to his season after injuring his shoulder in late January, then welcoming his child into the world with his wife, Ashley, last week. The Sunshine Coast local was unsure if he would compete at this event but surprised all with the first win of the season and the fourth CT win of his career. Wilson has always been in the World Title conversation, but this win provides the 29-year-old with his best ever start to his Title campaign. Wilson will sport the yellow Jeep Leader Jersey heading into the next stop on the CT, the Rip Curl Pro Bells Beach competition, which starts March 28 and runs through April 8, 2018. The intense men’s Final saw the two Australians, Wilson and Adrian Buchan (AUS), punch wave-for-wave, fighting their way out of massive tubes for the win. Wilson kicked off the heat with a fiery start, a near-perfect 9.93, by coming out of a huge barrel. 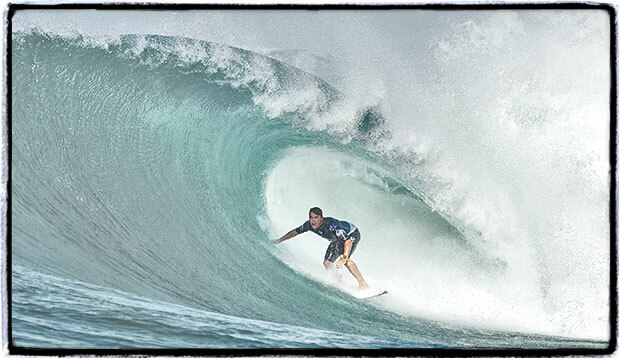 Wilson and Buchan continued to charge the Kirra sets, resulting in a close race for first. Buchan attacked back with a 6.50 and an 8.60 but was unable to overtake his compatriot. Having won two CT events in his career, Buchan is no stranger to the pressure on the big stage. The technically-gifted, rail-surfer moved through the field with precision, even on the final day, where the hollow Kirra waves would put most goofy-footers at a disadvantage. In the end, Buchan was up against the ropes with a rampaging Wilson running away with the lead, but he admitted that he was happy to finish second to his close friend. Griffin Colapinto (USA), the standout rookie from San Clemente California, amazed the world today with the first Perfect 10 of the 2018 CT season. Colapinto miraculously made his way out of three deep barrels in one wave to set the bar for the new season. The 19-year-old has been outshining surfing’s veterans in the first event of his rookie season, including his wins over Joel Parkinson (AUS), the 2012 WSL Champion and Gold Coast favorite, and veteran Michel Bourez (PYF). Unfortunately, Colapinto was unable to advance out of his Semifinal matchup against Wilson but will still exit as the rising-star of the event. All eyes will be on the young challenger this season to see how far he will push professional surfing in his rookie year. Owen Wright (AUS), 2017 Quiksilver Pro Gold Coast winner, was stopped in the first Quarterfinal by Buchan after struggling to find a rhythm at Kirra. Wright will exit with a 5th place result, moving to 5th on the Jeep Leaderboard. Earlier today, rookie Tomas Hermes (BRA) delivered another shock to the first event of the year by eliminating Filipe Toledo (BRA) in the Quarterfinals. Toledo’s result will boost him from 10th to equal 5th on the Jeep Leaderboard. Hermes’ Semifinal result blasts him up to 3rd on the rankings and well in the 2018 Rookie of the Year race. The world’s best surfers will now head to Bells Beach for the Rip Curl Pro, Stop No. 2 on the WSL Championship Tour, starting March 28 through April 8, 2018.